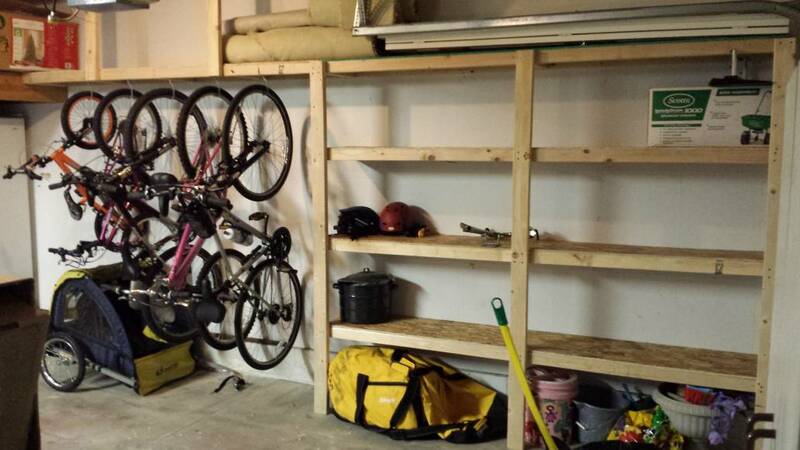 I want to get a ceiling rack of some type to hang my tandem in the garage. Can anyone make a recommendation? The typical hooks in the ceiling aren't very practical for the tandem. Most of the pulley types I see on the interwebs look too flimsy for that bike. ANy suggestions appreciated. Why not just build one? Thats nice looking. But it doesn't get it off the floor completely, which is what I want. I also want it to be useable for one person to put it up or get it down. Now I just need to see if they have one for a tandem. Hmmm. Which part of any of the bikes do you see touching the floor? I suppose I could respond by asking which part of your rack involves the ceiling? But I won't. I want to get my car, or anything else, under it. I don't have room on the walls for hanging bikes. Thats why I ask about ceiling racks. I really don't mean to make this a big deal. I just need to get the tandem off the floor. And up to the ceiling. If this Eye-talian company can set one up for a tandem, that will be the answer, I think. These are similar to what I have. They aren't perfect, but they do the job. My main complaint is that the hooks aren't designed really well to really grab the underside of the seat. They are fine holding on to the handle bars, but they've occasionally slipped off the saddle when I was hoisting it up. How about this? I've had a kid-sized wooden picnic table hanging up in my garage for years using it, so it's strong enough. That's a pretty slick lift. How tall are your garage ceilings? Those ceilings look like they aren't even 8 feet tall in that video. I am a member of a tandem group that says those do not work well for tandems. Unwieldy and the hardware is often not strong enough, although mtnbikers looks sturdier than most. According to the web site they will fit 9' ceilings which should be enough for me. But they say they are only good for about 48-50 lbs., which is not much margin for the tandem. They are also a bit pricey, unfortunately. But pretty cool. Last edited by creekster; 11-05-2018 at 06:14 PM. That’s pretty slick but unless you had a big garage you would have to have an empty bay in order to get it down or put it up. I think that’s the idea. You can park your car under it, but you’d have to back the car out to get the bike down or put it up. The sultry looks that chick gives when she uses the rack make me think maybe it’s an aphrodisiac, so it’s got that going for it as well! Maybe the part that is bolted to the ceiling. You mean the 2x4s that are supports for a shelf the under side of which has hooks on it from which bikes are held against a wall? Your structure is very nice and looks very well-built but it isn’t what I was looking for. This one is less... and has a "patented gas strut" for those heaver bikes! Awesome. The monkey is breaking out snarky praeteritio over a bike rack. I sure hope there's some political news today. I don't want to have to pull my car out one time let alone one hundred times that I would need to throughout the year. I agree it wouldn’t be worth it for the daily ride. This is for the tandem, though, which isn’t ridden nearly as often. Just on the off chance that any one cares, the company responded promptly to my email and said they do make tandem lifts on a custom basis. He sent me a drawing. 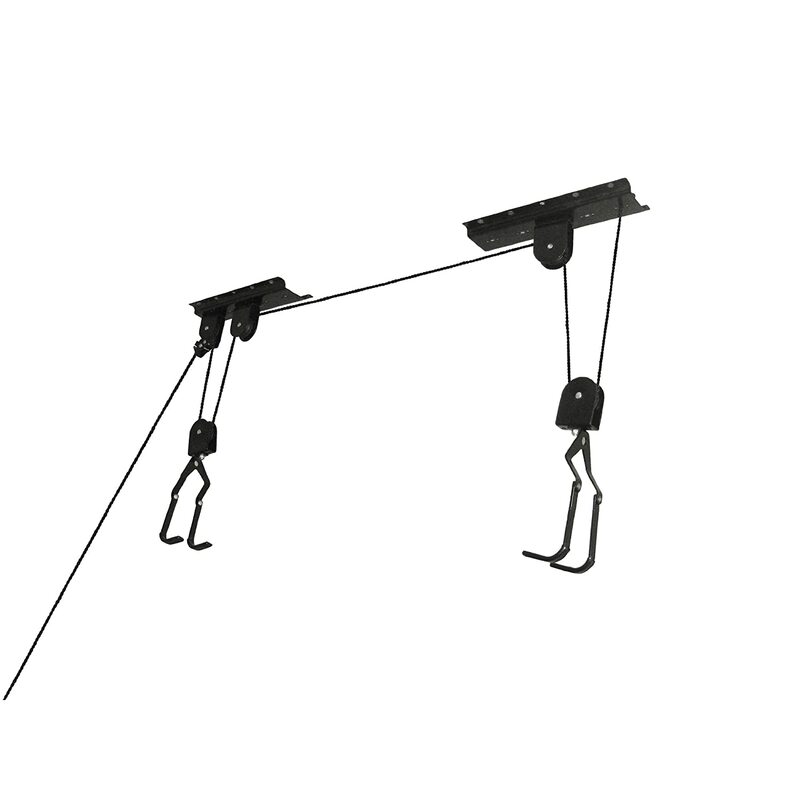 Longer tray, two gas struts and support arms. They also will customize it for my ceiling height and bike length and weight. I will give them the info and then see how much that is going to cost but, if it is affordable, it is a pretty nice solution. really happy for you creek. mazel! Thanks. Coming from you that’s a real pick me up. I never said you had to use the same design - just suggested you could build something yourself. Doesn't count - it's mounted to the wall, not the ceiling. You obviously have confused me for a welder. eh, if you were a welder, you'd hire a guy like pelado to do it for you. This would not work very well for a Tandem. Too narrow. Plus, as that master ceiling rack builder Pelado points out, it must be mounted on a wall. The advantage of the Italian system is that it can be built for a tandem and can be mounted in the field of the ceiling leaving walls free for something worthwhile, like Pelado's shelving system (not kidding about this last one, btw). You thought the original was “a bit pricey” but you are hoping that a custom one, built to fit twice the bike, will be affordable? I like you thinking. My thinking is usually what gets me in trouble. My first comment meant that among the choices of ceiling racks for bikes it was expensive. But it was the only one that did everything I wanted it to do, so it might be worth it. Any rack suitable for a tandem will be more expensive than one suitable for a single, so the question is whether the price for what is essentially a custom rack will be along the lines of 2x the normal prive or will it be some outrageous number?